Other Products: Distress Ink: Peeled Paint, Misc. Bead Berry - Green, Kennedy Grace Sequins - Pearl, Pink, Westcott Scissors, Trimmer, Red Versafine Ink, Glue Gun, Pink Foam. Instructions: Score a white piece of cardstock to 5x7" then take one of the sheets of patterned paper from the Sweet Peony collection and cut to 4.75 x 6.75" and adhere to the white cardstock. This will serve as the card front. Next take your sweetheart borders die and diecut using a white piece of cardstock. Adhere to the card front along the right-hand side of the card where the opening will be. Next take your piece of pink foam and diecut the eyelet circle die. Then, using the next die in the set, diecut a piece of the Sweet Peony paper and adhere to your pink foam eyelet diecut. You will glue this to the left of the card front not overlapping the sweetheart borders diecut. Stamp the sentiment using Tuexedo Black Memento ink. Now make your peonies using the large and small sets using red Versafine ink. 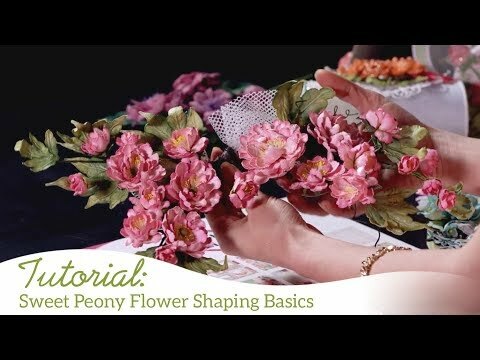 For the smaller peonies you will diecut 6, shape with the Deluxe flower shaping kit, and layer on top each other, staggered. Pierce the centers with the piercer from the Deluxe Flower Shaping Kit and add 1 yellow beaded stamen to the centers. Adhere on top of each other, staggered. For the large peonies you will diecut 1 large and 2 smaller peonies. Use your piercing tool and pierce the centers and add your stamen bunch (beaded, pearl and yellow). For the greenery, stamp using your Peeled Paint ink on the green sheet of Sweet Peony paper. 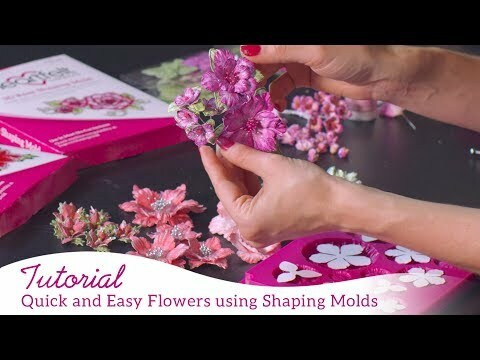 Diecut using the coordinating dies, shape and arrange among your peony flower clusters, along with green stamens. Glue your sequins on the card as desired to complete the look.